I’ve seen people advertise themselves as “natural light specialists” and then go one to explain why that makes them a superior choice for your portrait work needs. It’s good marketing, I guess (just ask your non-photographer friends which kind of light is better), but the science behind it didn’t feel right. It got me thinking about what it would take to replicate that “natural light look” entirely with flash. After some brainstorming and a few sketches I came up with an idea that made sense on paper, but to make sure I wasn’t missing something I decided to actually build it so we could test it out. 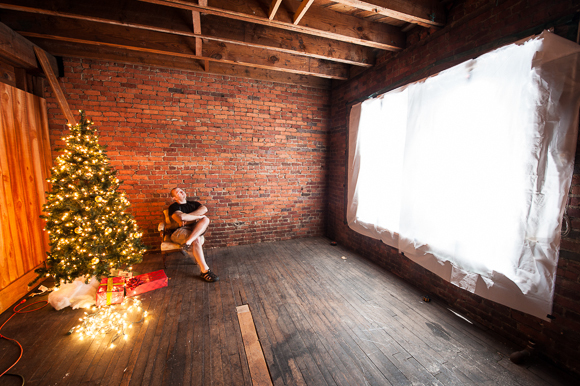 Fortunately for me, my friends at Bold Sheep Photography have studio space with amazing window light and they were kind enough to let me borrow it for a day to test out my idea. Before I began building, I spent some time trying to quantify exactly what I was trying to replicate in order to have some way to measure success or failure. I used a light meter to take readings throughout the room as well as at different spots on the windows to find out if the light was coming through evenly or if it was more intense in one spot. I also took some “before” photos to try to replicate later. Once I had an idea of what I needed to replicate, I used a tarp to cover the window to block out the incoming light and got started. A simple wooden frame made out of 2x4s was built and attached to the existing window frame. Thin sheets of reflective material was used to line the inside. I built mounts for the speedlights and positioned them so they would land across the areas that roughly matched the existing window panes. 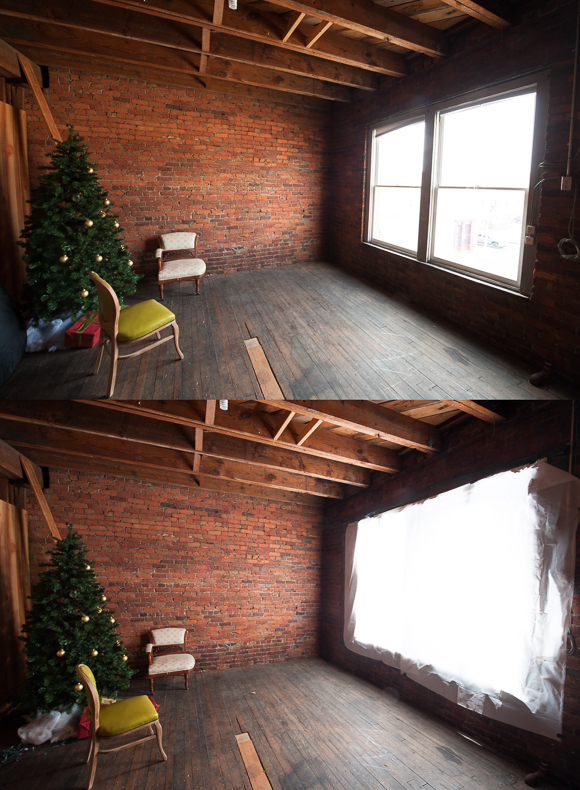 Four speedlights set to project lights to where the window panes would be. 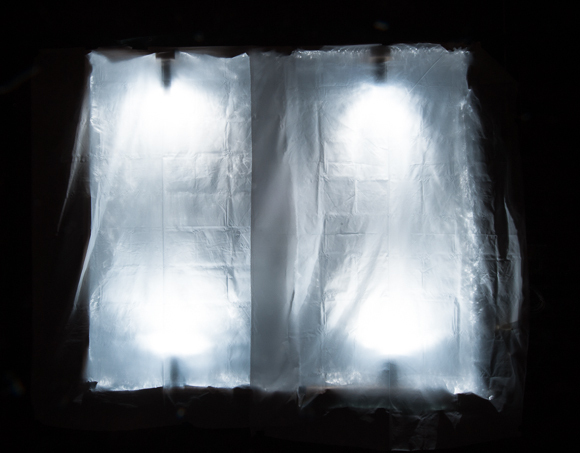 The outside of the box was covered with white nylon to diffuse the light to and to better match the apparent evenness of the light that was previously coming through the window. One half of the box complete. 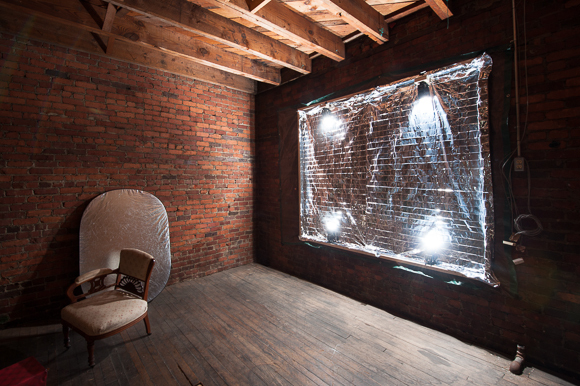 You can see the tarp over the window, the wooden frame, and the flashes firing through the nylon diffuser. Very underexposed view to see the light patterns being created inside the box. Not bad. The main difference you can see is the way the light falls off in the upper corner of the wall nearest to the window. This is because the window being inset into the wall by 4 inches gives it a small snoot/barn door effect which could be emulated by adding small furring strips around the lightbox frame. I had gone into this not knowing how much tweaking and repositioning and rebuilding I’d have to do. I was so pleasantly surprised at how well the first attempt worked I decided the time spent trying to get an exact match on the corners could be better spent elsewhere, so I called it done and went out for a milkshake. So what does all this prove? Well, not much really… but it does show that it’s possible to create one specific natural light look with flash. At the very least what I hope it achieves is being a good demonstration of the idea that light is light and what matters is how we modify and use it. The next step is having an one of my high-end photographer friends use it for a shoot and give me some feedback on how they think it compares. To me that’ll be the real test and I hope to have an update on for you on that next week! It’s not always practical to create the lighting situation you want. 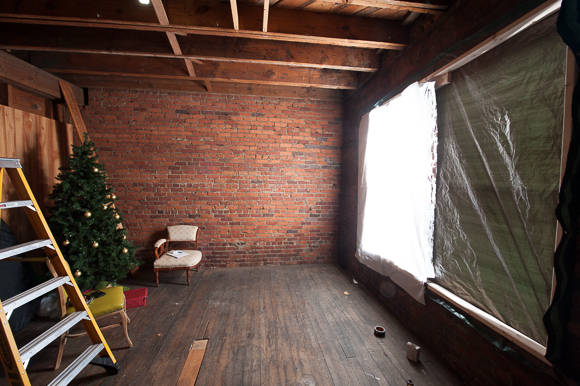 In my test, the setup was fairly simple – one large window in the wall of an enclosed area. More complex scenarios may require many large panels and complicated setups. Natural light will not always be when and where you need it. If your ability to do portraiture work is based on a few specific hours in the day and requires certain weather conditions, then you’re setting up a huge obstacle for yourself. Flash lighting can get expensive. While the light box materials only cost me roughly $30 to build, you’re seeing about $2,000 worth of strobe equipment in there to light it. And while quality flash equipment is getting more and more affordable these days, it’s still hard to beat the cost of standing someone in the shade and hitting them with light reflected from a car window sun shade. Flash gives you more options to achieve your creative intent. In the before/after photos above the exposures were the same, but in order to make that happen my settings were quite different. In order to shoot at f/8 and ISO 200 I had to use a shutter speed of 1/15 in window light. With flash, I was able to shoot the same f-stop and ISO at 1/200 with only 1/4 power flash. To translate that for those that don’t speak EXIF yet, that means that I have the option of shooting both shallow or deep depth of field without worrying about my subjects being blurry or covered in noise. Often, the right answer is a combination of the two. Look around at some of those photos where people are standing in front of a colorful sunset sky. If they look amazing, odds are the photographer was skilled at using fill flash in concert with the available light.